A member of the Egyptian parliament has filed a lawsuit over an article questioning why polygamy is allowed for men in Islam but not for women. The article in the newspaper Al Masry Al Youm was written by a female Saudi journalist, Nadine al-Bedair. It has been denounced by some Muslim clerics as inflammatory and anti-Islamic. But others have said it serves the purpose of highlighting how badly some husbands treat their wives. The article was clearly meant to cause a big stir and it has. Published in the independent newspaper Al Masry Al Youm, the article by Nadine al-Bedair suggests that polygamy should either be allowed for both men and women - or else there should be a new concept of marriage where men are not allowed to take a new wife just because they are bored with the old one. In Islam, men can marry four women at the same time - but only if they can treat them all equally. 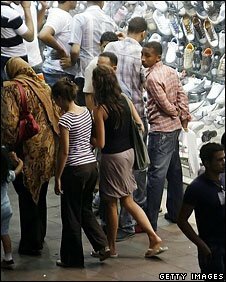 In practice, women in more traditional parts of the Arab world can suddenly find themselves after years of marriage with few or no rights if their husband chooses to take a new wife. The article has drawn predictably strong criticism from some Muslim authorities in Egypt, with one saying the author had no right to attack Islamic traditions and had to be stopped. An Egyptian MP has taken up that gauntlet, filing a legal complaint against the paper, accusing it of promoting vice. Other clerics have said male polygamy serves a social purpose, allowing widows, divorcees and unmarried women to find a partner. But one cleric at least has taken a different tack. He says the article is clearly not an actual call for female polygamy, but an appeal for people to wake up and see how badly some women are treated by their husbands.